Coat with knitting needles for: 0-3 (3-6, 6-9, 9-12) months. The density of knitting for a coat with knitting needles: 22 p. * 48 p. = 10 * 10 cm. Knit with garter stitch (faces, hinges and from the front and from the wrong side). Pocket (make 2 pcs. ): On the spokes 4 mm dial 12 (13, 15, 16) p.
Knit 28 (30, 32, 34) a number of garter stitch. Left shelf: 4 mm on spokes. dial 38 (41, 45, 48) n.
Track. series: 23 (25, 27, 29) persons., tie 12 (13, 15, 16) deferred pocket hinges, 3 faces. To knit 1 row. persons. P.
Right shelf: 4 mm on spokes. dial 38 (41, 45, 48) n.
Track. number (party side): 23 (25, 27, 29) persons., close the next 12 (13, 15, 16) item, 3 persons. Track. row: 3 persons., tie 12 (13, 15, 16) deferred pocket loops, 23 (25, 27, 29) persons. Knit 23 (25, 27, 29) from the right shelf, get 34 (37, 40, 44) n., Knit 23 (25, 27, 29) n. Left shelf - get 80 (87, 94, 102) n .
Sleeve: on spokes 4 mm. dial 29 (31, 33, 35) n.
Go for spokes 3,25 mm. Go for spokes 4 mm. Add 1 pt on each side in each 8th row, until we get 41 (45, 49, 43) n.
At the height of 17 (19, 22, 24), see at the edges of the mark. 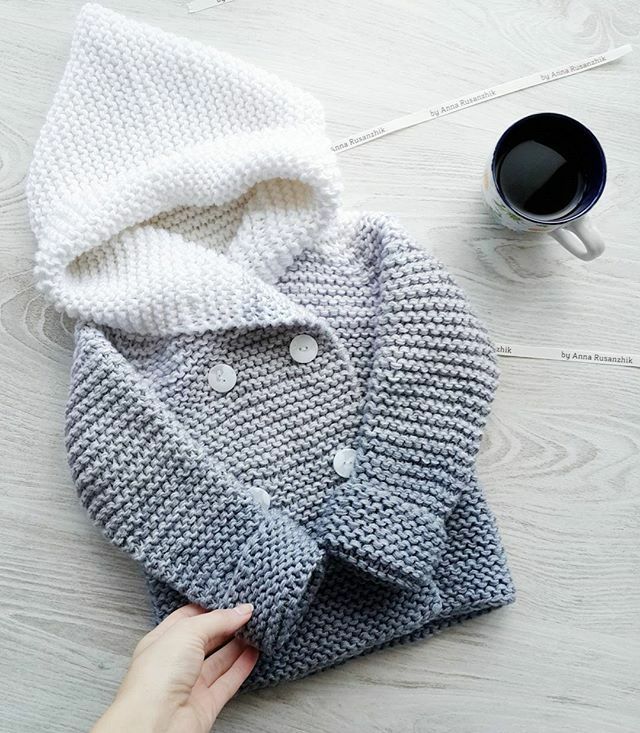 Assemble the coat with knitting needles: fold the hood in half, sew the upper seam, connect the set edge of the hood with the neck of the back, sew the sleeves into the armholes, use the tags, connect the sides, make the seams of the sleeves, sew the pocket, sew the buttons. Is there a pattern for kids size 7 in this cardigan? Es posible conseguí traducción de los patrones? How do you get the gradual changes in colours, Debbie Bliss Rialto comes in solid colours not graded colours?